Blog | Drama Classes For Kids | Child Education Franchise - When teamwork works! Anthony and Ana-Maria both trained at Royal Welsh College of Music and Drama. Anthony has had parts in various TV shows including Emmerdale, Misfits and Trollied, and has helped create a theatre company, "NOT TOO TAME" which brings shows to communities that don't have experience of/ or access to the theatre. Since leaving drama school Ana-Maria has worked across all parts of the industry, her credits include working at the National Theatre, London and a guest lead on a BBC crime Drama. Ana-Maria met after she'd seen Anthony perform in a show in London. Why did they chose Pyjama Drama? Ana- Maria had experience working for Pyjama Drama in a neighbouring franchise and was inspired by the way the children reacted to the classes. After telling Anthony about her days at work, they felt it was something they could bring their skills to and make it a success in their own area. Do they think working and living together will be challenging? The main difficulty will be sticking to office hours and also making sure there is some down time apart.- the gym and yoga work wonders for this! And how will planning a wedding fit in with starting a new business? Classes for children up to five years starting on Thursday afternoons at The Spike Community Centre, Guildford and Saturday mornings at St John’s, The Stirling Centre, Stoke, Guildford. 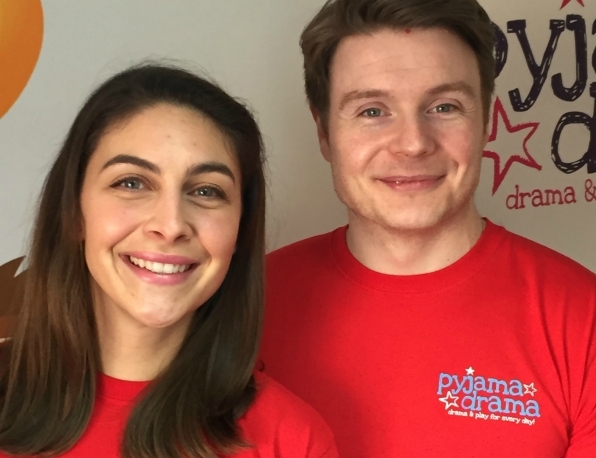 Get in touch to book a class or find out more about Pyjama Drama in Guildford!